Patellar tendinopathy is when the tendon that joins your kneecap (patella) to your shin bone (tibia) becomes gradually worn down. Your tendon becomes weaker and painful, and is less able to cope with loading, such as when you walk. 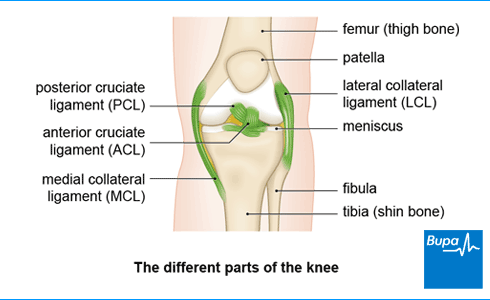 Patellar tendinopathy is also called ‘jumper’s knee’ because the injury commonly occurs during sports that involve jumping, such as basketball, netball or volleyball. It’s also sometimes referred to as patellar tendonitis. The main thing you’ll notice is pain, or aching, just below your kneecap. You’ll probably start to notice a gradual increase in pain, rather than having an injury that suddenly causes it. When you first get the pain it will probably only come on after you exercise. As time goes by you may get the pain during exercise, perhaps reducing after you warm up. This may then develop into constant pain during activity. Patellar tendinopathy may not affect how well you can perform in your normal activities at first. But as the condition worsens you’ll probably find you’re not able to perform so well. As well as having pain, the affected area of your knee may be tender to the touch. If you don’t have treatment for patellar tendinopathy there’s a possibility that your tendon will eventually tear (rupture). If this happens, you may have sudden pain and difficulty walking. Your knee may also give way. It’s unclear exactly why some people develop patellar tendinopathy. It’s an overuse injury, which means it can develop following repeated stress on your patellar tendon. This may happen if you frequently jump, which is why people who play sports such as volleyball and basketball often develop it. The strain on your patellar tendon when you land from a jump results in damage and a gradual wearing down of your tendon. You may be more likely to get patellar tendinopathy if you’re aged between your teens and your thirties. However, you can also get it when you’re older. It has been linked to overtraining, poor technique and playing on hard surfaces. The initial treatment for patellar tendinopathy aims to reduce your pain. You can do this with rest, ice and medicines to reduce pain and inflammation. Further treatment includes stretching and strengthening exercises with physiotherapy to gradually get you back to your usual activities. You may need surgery if your patellar tendon ruptures. You may find it helpful to see a sports medicine professional, such as a physiotherapist or a sports doctor. Your GP may refer you, or you may be able to book an appointment directly with a physiotherapist. There’s no quick fix for patellar tendinopathy. You may need a long period of rest and rehabilitation before your symptoms go completely. However, the earlier you get treatment, the quicker and more likely you are to recover. You should reduce the amount of any activity you do which is causing your pain, such as jumping and squatting. Your doctor or physiotherapist may suggest some alternative exercises that put less stress on your tendon, such as swimming and cycling. Applying ice to the affected area can help to relieve your pain. Try applying it for 15–20 minutes, every two to three hours. This may be especially helpful after you’ve been active. Don’t apply ice directly to your skin as it can give you an ‘ice burn’ – place a cloth between the ice and your skin. You can buy certain non-steroidal anti-inflammatory drugs (NSAIDs) such as ibuprofen over the counter. These may be helpful for short-term pain relief of patellar tendinopathy. However, if your pain goes on for more than two weeks you shouldn’t continue to take them without discussing this with your pharmacist or GP. This is because they may have side effects when taken long-term. Your GP may be able to prescribe stronger NSAIDs if you need them. Always read the patient information that comes with your medicine, and if you have questions ask your pharmacist or GP for advice. Making sure you follow any physiotherapy and rehabilitation programme you’re given will be an important part of your recovery. Your physiotherapist will carefully assess your knee and then plan an individual programme of rehabilitation exercises to help strengthen your knee and leg muscles gradually. Treatment may involve stretching, and specific strengthening exercises. Sometimes your physiotherapist may suggest you try wearing patellar straps or braces, to help support your knee when you’re active. You may also be offered treatment with extracorporeal shockwave therapy (ESWT). This involves applying shockwaves to the affected area in order to reduce your pain. Most people with patellar tendinopathy don’t need surgery. However, it may be an option if your symptoms aren’t improving with other treatments after 3 to 6 months, or if your tendon tears (ruptures). The aim of surgery is to repair your tendon. It’s usually carried out by an arthroscopy. This involves using a very fine telescope (the arthroscope) and tiny surgical instruments inserted through small cuts in your knee, to perform the procedure.